The Ergo Ex is designed to provide unmatched comfort and unmatched customizability. 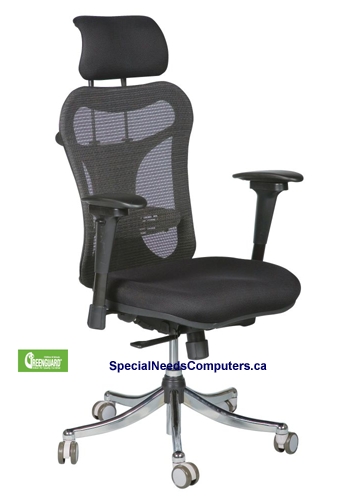 Padded and contoured seat measures a generous 21"W x 19"D.
Seat slides forward and backward. Height adjustable from 18" to 21 3/4". Stylish mesh back (22 1/2"H x 20 1/2"W) tilts and includes adjustable lumbar support device. Padded headrest tilts and is height adjustable. Arm rests swivel from side to side, slide back and forth, and adjust in height. Includes a durable 5-star base with casters for easy maneuverability.